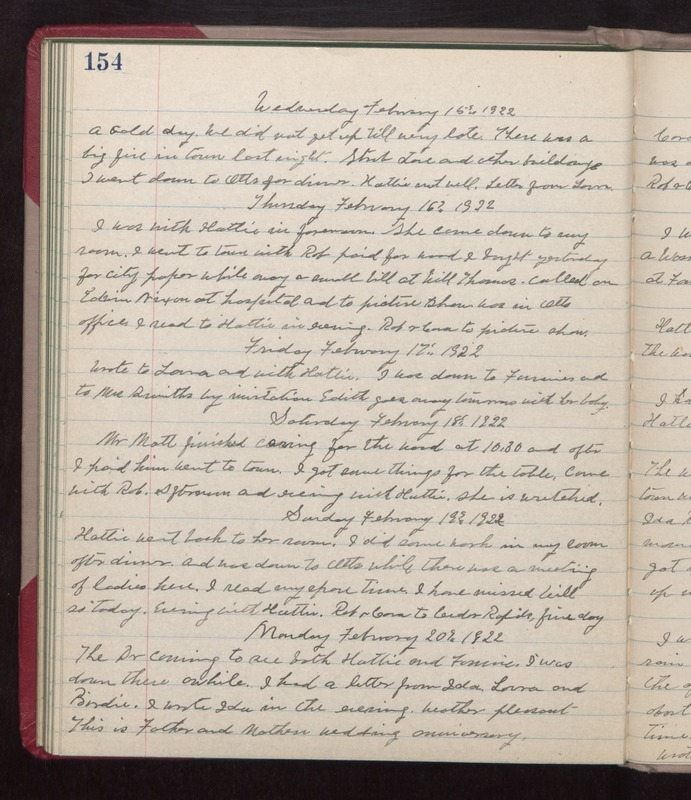 Wednesday February 15th 1922 A cold day. We did not get up till very late. There was a big fire in town last night. Stroh store and other buildings. I went down to Otts for dinner. Hattie not well. Letter from Laura. Thursday February 16th 1922 I was with Hattie in forenoon. She came down to my room. I went to town with Rob, paid for wood I bought yesterday for city paper while away a small bill at Will Thomas. Called on Edwin Nixon at hospital and to picture show. Was in Otts office. I red to Hattie in evening. Rob & Cora to picture show. Friday February 17th 1922 Wrote to Laura and with Hattie. I was down to Fannies and to Mrs Smiths by invitation. Edith goes away tomorrow with her baby. Saturday February 18th 1922 Mr Matt finished caring for the wood at 10.30 and after I paid him went to town. I got some things for the table. Came with Rob. Afternoon and evening with Hattie. She is wretched. Sunday February 19th 1922 Hattie went back to her room. I did some work in my rook after dinner and was down to Otts while there was a meeting of ladies here. I read my spare time. I have missed Will so today. Evening with Hattie. Rob & Cora to Cedar Rapids. fine day. Monday February 20th 1922 The Dr coming to see both Hattie and Fannie. I was down there awhile. I had a letter from Ida, Laura and Birdie. I wrote Ida in the evening. Weather pleasant This is Father and Mothers wedding anniversary.